China's women set a world record in the Asian Games' 10m air rifle team event Monday after one of their shooters was disqualified but then reinstated following a heated appeal. Yi Siling, Wu Liuxi and Zhang Binbin combined to score 1,253.8 points -- just 0.1 points ahead of the previous mark of 1,253.7, also set by China, at the Asian shooting championships in Tehran last year. But China nearly missed out on both the gold medal and the world record when Zhang was disqualified for shooting with a heavier rifle during the qualification round. She was eventually allowed to compete after judges upheld her team's vehement appeal, a lengthy process which delayed the individual final for 30 minutes. 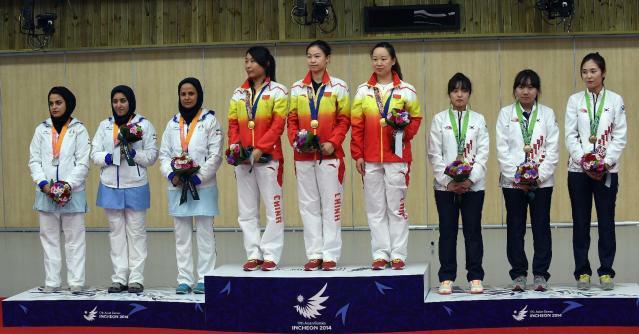 A relieved Zhang then went on to win a bronze medal in the individual event, where Iranian teenager Najmeh Khedmati won gold ahead of her friend and team-mate Narjes Emamgholinejad. "I was very sad when I was told I was disqualified, but my team-mates and coaches backed me and said they would appeal," she told reporters. "I just needed to control my emotions going into the final." Organisers declined to reveal reasons for the U-turn by the jury, but one shooting official said the disqualification may have been due to a technical error. "I am just guessing, but it is possible the weight of the rifle had been wrongly calculated," the official, who did not want to be named, told AFP. The reinstatement meant disappointment for Singapore, who were in the bronze medal position before the Chinese appeal was upheld but had to settle for fourth. And the Iranian team, who had been declared winners prior to the appeal, had to settle for the silver with a score of 1,245.9. South Korea took the bronze with 1,241.6. But Iran hit back with a one-two in the individual event as Khedmati, 18, beat a strong field including reigning world and Olympic champion Yi Siling, who finished fifth. Khedmati and Emamgholinejad warmly hugged each other after the final, but played down any suggestions that they had been robbed of the team gold. "We respect the decision of the jury," Khedmati told AFP. "We always play according to the rules. The whole team is happy we won a gold and two silvers today." Khedmati, who began shooting just four years back, said her next target was winning a medal at the Rio de Janeiro Olympics in 2016. "Everyone who plays sport dreams of the Olympics and I am no different. Beating such big names has given me a lot of confidence." 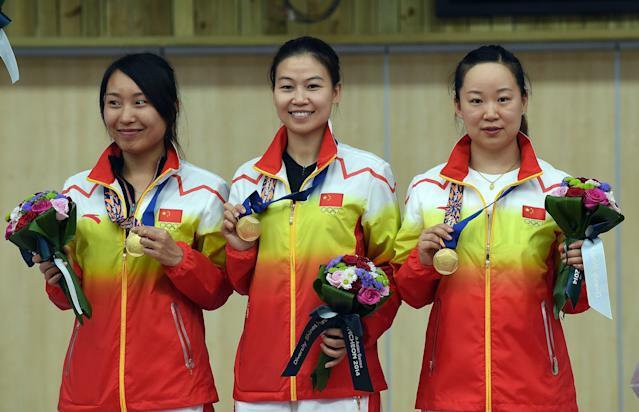 China added the women's 25m pistol individual gold when Zhang Jingjing, fresh from her world title win in Spain this month, beat compatriot Chen Ying 7-5 in the final. Gundegmaa Otryad of Mongolia took the bronze with a 7-5 win over Kwak Jung-Hye of South Korea in the play-off for third place. Kwak had the consolation of winning the team title for the hosts with Kim Jang-Mi and Lee Jung-Eun. The Korean trio finished with 1,748 points, one ahead of China's tally of 1,747. India picked up the bronze with 1,729 points. Of the 12 titles contested so far in the 44-event shooting competition, China have won seven golds, South Korea three and India and Iran one each.